Spinlife University: What Type of Mobility Device is Right for Me? Mobility Scooters are equipped with an easy-to-use handlebar/tiller that is used to drive and control. A handlebar/tiller can be adjusted to each user but if you have limited arm strength or it would be uncomfortable to have your arms outstretched operating the scooter might be uncomfortable. 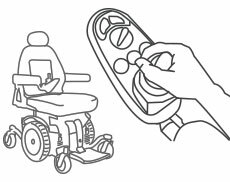 A Power Wheelchair is operated with a joystick that is comfortably located at the end of the chair's arm. 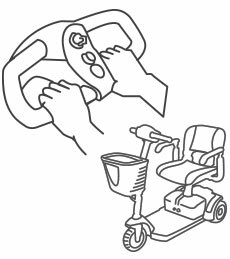 You operate a power chair by small movements of the joystick, side-to-side or front to back. If you have limited fine motor skills, operating a power wheelchair may be challenging. Can you extended your arms in front of you comfortably and rest them in this position while holding on to a bar for support? Can you sit upright comfortably? Straight Tiller handlebars are great for individuals who are able to apply pressure with their hands similar to squeezing a wet sponge. 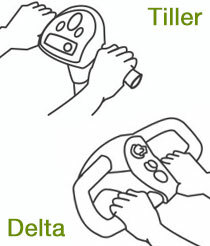 Delta handlebars should be your choice if your are unable to hold pressure with your hands for long periods of time. If you answered "yes" to the above questions, a scooter might be right for you!